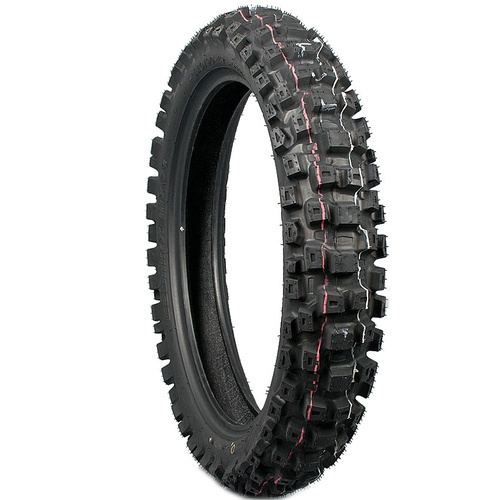 The Dunlop MX71 Geomax Hard Terrain motorcycle tyre has a profile design with more tread volume (greater land/sea ratio) in the shoulders for excellent cornering grip. The MX71 has a unique placement of "camber traction blocks" for optimum lean-angle traction and grip when exiting corners. The Dunlop Geomax Reinforced Pattern (GRP) is design for enhanced wear and resistance to tread block tearing. The successor to the popular D745 and D739, the GEOMAX MX71 motorcycle tyre incorporates innovative features to help deliver optimum performance in hard-pack/blue-groove conditions while also crossing over well into intermediate-terrain conditions. Features: Profile design features more tread volume (greater land/sea ratio) in the shoulders for enhanced cornering grip. Directional front tire pattern and geometric shoulder-block shape for enhanced braking grip and cornering traction, and enhanced slide control. Directional and asymmetric rear tire pattern plus Double Tornado Wave rear tire block distribution for optimum traction and braking ability. Unique placement of camber traction blocks for optimum lean-angle traction and grip when exiting corners. Dunlop Geomax Reinforced Pattern (GRP) design for enhanced wear and resistance to tread block tearing. Variable spacing between center tread blocks for enhanced performance. Recessed biting edges yield enhanced traction for greater grip throughout a wide range of terrain conditions.